Western starring Dale Robertson. Ageing gunslinger Jagade cannot accept that the Old West is not as wild as it was in his youth. His stubbornness brings him into conflict with the town marshal, even though he recently saved the marshal's life. 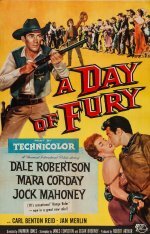 This moody little western is very much of its time, as rebel Dale Robertson finds himself outside civic convention in a conservative frontier town. It has its moments, but Robertson is both too bland and too old for the role, certainly no fury there, and the direction is very average. Former stuntman Jock Mahoney registers well in a serious role, and TV western aficionados will relish watching The Range Rider's Mahoney paired with Tales of Wells Fargo's Robertson. 1950s starlet Mara Corday is the girl, and she's certainly well worth tuning in for.